Harry Combs established a partnership in December 1966 with Charlie Gates (left). In 1958, Combs Aircraft Corporation, operating out of Stapleton Airport, became the leading Beechcraft distributor in the United States. In 1962, through extraordinary marketing and customer service techniques (and a lot of hard work), they became Beechcraft’s largest distributor in the world. The company accounted for nearly 10 percent of factory total production. Harry Combs, who had organized an advisory council for Beechcraft, was named “Beechcraft Man of the Year.” That same year, Combs sold Mountain States Aviation, which operated as a dealership for Piper and Stinson. As a Beechcraft distributor, Combs received several other awards; one was a trip to Veradero Beach in Cuba. This trip would bring memories back of a long ago visit to Canada in 1917 when, as a four-and-a-half year old, he visited his father, a cadet training for the Royal Flying Corps. While playing tennis at Veradero Beach, a “statuesque” blonde invited he and other players in for a drink. She happened to be Irene (Foote) Castle, half of Vernon and Irene Castle, America’s dancing sweethearts of the early 1900s who were later portrayed by Fred Astaire and Ginger Rogers in “The Story of Vernon and Irene Castle.” Irene Castle had at one time shocked France when she arrived in the country with “bobbed” hair, which later became the rage around the world. Her husband had been Combs’ father’s flight instructor. Vernon Castle had been taken out of the war to keep him out of harm’s way. Tragically, in 1918, he was killed during a training mission in Texas while training in Jennys in Fort Worth. “When my grandmother pointed out those two heads in that Avro flying by,” said Combs, “it was my dad and Vernon Castle. Dad was very pleased that Vernon was his instructor.” Combs related the story to Irene Castle. Touched, she showed him two pictures of airplanes, a Sopwith Camel and a Newport, which one of her husband’s friends, Tom Oliver, had painted, and presented to Vernon. She gave these to Combs. He has the pictures hanging on the wall of his den in Wickenburg, Ariz., and has cherished them for years. Rumors abound as to why the onetime “golden boy” of Beech had a falling out with Olive Ann Beech. Was it his connection to the flamboyant, mustachioed Roscoe Turner and his company, Roscoe Turner Aeronautical, an FBO that had been founded in Indianapolis in 1932 and was a Beech dealership? Or was the rumor true that Combs and Beech had quarreled when Combs made a disparaging remark about Beechcraft’s King Air in comparison to the Learjet? (“There is no comparison, Olive Ann. The Lear is twice as fast and costs the same amount.”) Or was it just the fact that Combs would become involved with the Learjet, the King Air’s “competition,” through his association with Lear’s founder, William Lear and Charles Gates of the Gate’s Rubber Company fame? In 1955, the first aviation jet landed at Combs’. It was a French four-passenger MS-760 Morane Sauliner powered by two turbojet engines with a cruising speed of an astonishing 410 mph, and a range of 1,000 miles. Combs might not have known it at the time, but he would soon enter the jet age—at full power. In 1961, President John F. Kennedy appointed him to “Project Beacon.” The special task force charged with modernizing the nation’s air traffic control system. Combs’ plan for segregating air traffic based on aircraft performance was adopted by the committee and eventually partly implemented by the FAA. That same year he participated in a “see and be seen” capability test with two F106Bs (supersonic fighters) at 52,000 feet. Both aircraft reached twice the speed of sound, at a closure rate of 3,000 miles per hour. Along with helping to establish an air-training base in Arizona for CIA Covert Operations, he was appointed to the National Air and Space Administration’s Technical Advisory Committee, in the early stages of the manned space program, and participated in a weightless experiment at Wright Patterson Air Force Base. Combs became acquainted with Charlie Gates when they began “swapping hunting adventures and outfitters.” Combs had been in Alaska bear hunting, and arranged a meeting between Gates and his guide, who later used the guide for a hunting trip. “We had the same hunting guides in Kenya and in Botswana,” said Combs. In December 1966, the Gates Rubber Company purchased Combs Aircraft for $1.5 million. Combs Aircraft, renamed Combs Gates Denver Inc., became a subsidiary of Gates Aviation Corp. Combs thought it was time to retire, and he did, briefly. Months later, Combs decided to try to help his friend Roscoe Turner, whose company, located at Indianapolis Airport, was facing financial difficulties, and discussed the company’s woes with Gates. In March 1967, Gates Rubber Company acquired the balance of Roscoe Turner Aeronautical; the Combs Gates’ network of fixed base operations, although numbering only two at the time, was born. But another hornet’s nest was soon stirred. Lear Jet Industries, founded by William P. Lear Sr. and based in Wichita, was also financially troubled. After making a trip to the plant, Combs reported to Gates that the problem wasn’t with the aircraft, but with sales. Combs introduced Gates to Lear, and in so doing, helped to facilitate Gates Rubber Company’s purchase of the controlling interest in Lear’s company in April 1967. From all appearances, Combs Gates was a threat to Beechcraft. “Olive Ann thought we wanted to get control of her company,” says Combs. A troublemaker had told Mrs. Beech that Combs and Gates were going to buy controlling stock in Beechcraft. “We had no intention of doing that!” said Combs. “We (the Learjet side of Combs Gates) were buying a lot of bases and we were competing heavily with the King Air.” At the time Combs Gates Denver Inc. was still a Beechcraft distributor. Beechcraft eventually cancelled all of their dealings with Combs Gates. On Dec. 2, 1969, the shareholders of Learjet Industries Inc. ratified an agreement of reorganization wherein Gates Aviation became a wholly owned subsidiary of Learjet Industries. The name was changed to Gates Learjet Corp. Combs, who had some stock in the company, was elected to serve on the board of directors of Gates Learjet. The same year, Combs Aircraft purchased the assets of Pacific Airmotive. This became Gates Aviation Palms Spring Inc. In October 1971, following the untimely death of G.H.B. “Hig” Gould, Combs was elected president of Gates Learjet. On October 7, Combs—whose beginning salary was about $50,000 annually—headed for Wichita. When Combs arrived, he soon became aware that everyone was “leery of Lear.” At that time, the company had a $13 million deficit and several problems. One was Lear’s design of his model 24-D, a Swiss fighter. “Bill Lear said, ‘When I finally got the cabin worked out, I damn near shot myself—not enough room. It had the old Air Force engines on it. Plus, the first jets, straight jets, ate fuel like it was going out of style, and they had quite a restricted range,” said Combs. Then, there was the problem with the sales team. The first day, he approached a pilot and told him he would need him to demonstrate the plane in Columbia that Friday and would need him to fly out on Wednesday. The pilot’s first response was that he played golf on Wednesday mornings. But he would go—after the golf game. Combs agreed that he could make the trip on Thursday. Combs, used to selling aircraft, gave the pilot, who had no selling experience, a short lesson. The Lear took off at noon; three hours and ten minutes later it was in Belize, British Honduras. It was in Bogotá by sundown. “Only fighters could do that!” said Combs. And that was just in the first few days! Combs realized quickly that they were using the wrong system. And so, Combs held a meeting—the first of many. Under Combs’ leadership, Gates Learjet was able to perform one of the most dramatic aviation-related financial turnarounds in America’s history. “By June of 1972, we had $15 million bucks in the bank and we didn’t owe anything. Plus, we had back orders — we were going like hell!” said Combs. 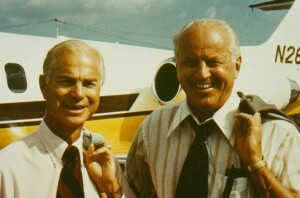 In 1973, Combs was acknowledged as the first industry president to be rated in a jet aircraft manufactured by his company. That same year he was nominated into the Colorado Aviation Hall of Fame. In 1975 Combs Gates, Denver opened a new executive terminal on Stapleton’s north side. An independent survey of over 30,000 professional pilots recognized Combs Gates as the number one FBO in the nation in 1977, an honor they would be given for the next 14 consecutive years. That same year, Gates Learjet’s three facilities—Combs Aircraft, Roscoe Turner and Gates Aviation, Palms Springs—were officially consolidated under the name Combs Gates Inc. The following year, a team of Chinese engineers and aids visited the Learjet plant in Tucson, Ariz., to make a study of Learjets. They were searching for five airplanes that could fly high and be converted to carry radios and radar equipment that would detect anything within a given distance from China’s eastern to western borders. After the tour, Combs was invited to visit China. On Dec. 10, 1979, Combs flew the first private (non-government) Western airplane into Red China. Combs flew a Lear over the Elysians to Guam, and then on into Shanghai. On approach, Combs and his copilot immediately faced a language barrier. Neither spoke Chinese; when the controller did speak English, he spoke too rapidly to understand. Combs did the only thing he could think of. “I told them that I was using the Jeppesen manual that a guy in Denver had figured out and we were just going in according to the manual,” says Combs with a laugh. “And we landed.” Once the aircraft was refueled—compliments of the government who, in China, owned all airplanes and fuel—the pilots were told that they were expected in Beijing and “you go!” So, they went. Their demonstration resulted in the sale of the five Lear 35s, at a chiseled down price of $1.5 million a piece, and a tour of China for Combs. In 1980, Combs Gates secured leasehold at Fort Lauderdale-Hollywood Airport, establishing Combs Gates Fort Lauderdale. Combs was also elected to the board of directors of NASA that year. Combs, at the time 69, approached Gates in 1982 and told him he was going to resign. By the end of his term as president, the company had $240 million in equity. During his presidency, they produced Learjet models 24, 25, 28, 35, and 55, and received FAA certification for normal flight operations up to 51,000 feet — the highest cruising altitude approved for any civil aircraft in the world, except the supersonic Concorde. In July 1983, Combs Gates dedicated a new executive terminal at Fort Lauderdale Airport, which included Gates Learjet/Garret AiResearch 731’s major service center complex. A year later, they dedicated their Gates Learjet/Garret AiResearch 731’s major service center complex as part of a new executive terminal at Combs Gates Bradley. Combs Gates Denver dedicated a new corporate headquarters/executive terminal and Gates Learjet/Garret AiResearch 731 major service center complex on the southwest side of Stapleton International on Aug. 28, 1987. In July 1988, AMR Service Corporation, a sister company to American Airlines, purchased Combs Gates’ network of six FBOs. These bases were consolidated with three existing AMR Service FBOs as AMR Combs the following year. (The maintenance part of the company was sold to Bombardier.) 1990 would see the opening of AMR Combs McAllen (Texas) and expansion into Mexico. When Denver International Airport opened in 1995, AMR Combs DIA celebrated their opening as well. By the end of 1997, AMR Combs’ combined FBOs employed more than 110,000 people, and had annual revenues of $17.7 billion. In 1998, AMR Combs, based in Dallas, began looking for a buyer for its 14 FBOs, including two in Mexico and one in Hong Kong—the rest were domestic. The decision was made based on the parent company’s decision to focus solely on its core airline operations. At that time, four of the sites—Hartford, Indianapolis, Fort Lauderdale and Denver-Bombardier Aviation Services—were operating service centers for Learjet, Challenger and the new Global Express. In March 1999, in a $170 million transaction, AMR Corp. sold AMR Combs, its executive aviation services unit, to Signature Flight Support, BBA Group’s service division, which added the FBOs to their already existing 42. This ended Combs’ name association with the nationally praised FBO, but his memory lives on. Signature Flight Support DIA is located at 7850 Harry B. Combs Parkway. There, a Combs’ Wall of Fame chronicles this aviation legend’s legacy. Combs contributed in various other ways to the field of aviation. From 1951 through 1954, Combs served as state director of Civil Defense for Air. He was elected to the board of directors for the National Aeronautic Association in 1980. He also served on the board of governors of Aerospace Industries Association of America. He received the U.S. Department of Transportation FAA’s Distinguished Service Award for leadership in promoting flight safety, and The Wings Club’s Distinguished Achievement Award for contributions to the development of the general aviation industry. In 1982, he became the president of Wings Club, a prestigious New York-based aviation forum. In 1983, he was elected as an honorary member of the Lafayette Flying Corps. He was elected the National Aeronautic Association’s “Elder Statesman of Aviation Award” in 1984. In 1996, he was nominated into the National Aviation Hall of Fame, located at Wright Field, Dayton, Ohio. Combs has logged more than 21,000 hours as a pilot and now owns a Lear 35 and a Bonanza 36—he still flies the Bonanza. But his contributions were in other areas as well. In July 1968, they made their trip to see the Apollo 11 launch at Kennedy Space Center. Gov. Love and the Combs returned to Denver. Combs watched the landing on a television at the ranch. This, in a roundabout way, resulted in Commander Neil Armstrong and his family vacationing at The Sleeping Indian. With the help of a high-powered telescope, Armstrong showed them where he had landed and mapped out his moonwalk. Following was a Combs/Armstrong hunting expedition to Scotland. It was during the mid-1970s that Combs would regret missing a chance to meet Orville Wright years before. As a member of Conquistadores del Cielo, an elite group of prestigious aerospace executives, Combs and his cohorts often placed bets on not-so-well-known aviation history. One day, Combs found that his knowledge of the Wright Brothers was lacking. Jim Greenwood, fellow staff-member at Learjet, supplied him with some information about the Wrights. Then, Armstrong, by then a good friend, presented him with the Wright Brother’s diaries. Combs’ search for the truth about the Wright Brothers led him to Kill Devil Hill, where the Wright’s first flights took place, and to meet many who were first-hand witnesses to the events that led up to the flight of the first powered aircraft. Combs set out to tell the real story. In 1979, his book, “Kill Devil Hill: Discovering the Secret of the Wright Brothers,” a definitive work on the Wright brothers, was published by Houghton Mifflin. It won several prizes for excellence in aviation writing, including the Aviation/Space Writers Association’s award for top national winner in the nonfiction aviation category in 1980, and, that same year, the James J. Strebig Memorial Award, the nation’s highest honor for aviation writing. In 1983, he completed, “How Strong is the Wind,” a 40-minute film based on his book, “Kill Devil Hill.” Produced as a public service, this color documentary, which he narrated, was distributed to educational, industrial, business and professional organizations worldwide, as well as being seen on national television. The book and documentary should make a believer out of even the staunchest non-believers. In 1985, Combs was the recipient of the coveted Wright Brothers Memorial Trophy for “over half a century of significant and enduring contributions to aviation as a pilot, an industrial leader, an author, and an advisor to government in the United States.” Then Vice President George Bush presented the award. Each year, the National Aeronautic Association of the U.S.A. presents this award to a new recipient on the anniversary of the historic first flight at Kitty Hawk, N.C. Other recipients have been Charles A. Lindbergh (1949), Lt. Gen. James H. Doolittle, (1952), Dr. Igor I. Sikorsky (1967), Senator Barry M. Goldwater (1973), and Olive Ann Beech (1980). Fifteen years after completing “Kill Devil Hill,” Combs, who now summers at a ranch in Montana and winters in Wickenburg, but also keeps a house in Denver, tried his hand at writing a Western novel. “Brules,” completed in 1992, is the story of a mountain man (Cat Brules) and the young man, brought up on a ranch in Colorado, who befriends him and hears and tells his story—in colorful and accurate Western dialogue. Combs, a grandfather, found a way to entertain his children through story telling. Besides his love for aviation and his adeptness at journalism, Combs has always had an interest in archeology. He has skied his way down many ski slopes and “big game” hunted on several safaris to Africa—Kenya, Uganda, Mozambique, Southern Rhodesia (Zambia), and Botswana. He vacationed in Scotland with members of the Conquistadores, where they hoped to be able to see a showing of the Red Arrows, the Royal Air Force Aerobatic Team. The group first declined due to the number of their group—about 70 made the trip. “Well, you see sir, we never perform unless there is an audience of at least 200,000,” said someone with a thick Scottish brogue. “We think you ought to do this because the president of our organization is the president of British Aerospace, which supplies (your) fuel,” responded Combs. He also listed off various other members of the Conquistadores, which includes presidents of airlines, etc. They were treated to their own private showing. He has brown bear hunted and fished in Alaska, and fished in the Canadian Yukon and New Zealand. He also flew uncharted Alaskan bush country prospecting uranium. His research for the plentiful information stored in his memory bank has taken him to places like Iceland, where he made three expeditions. He can tell you everything you need to know about the Old West, the Wright brothers, the Sopwith Camel, the King’s Cup Races, the early history of jets, the Arctic tern—you name it. Speaking of the Arctic tern: this seasoned traveler breeds in the Northern Hemisphere, mostly within the Arctic Circle, but flies to spend the northern winter in the Southern Hemisphere, mostly in the Antarctic ice packs. The round-trip journey between Arctic and Antarctic is 21,750 miles. According to Combs, aviators can take a tip from this hard working and hard flying bird. “If you’re going to fly, do it right!” says Combs. And stars and time to love. “Kill Devil Hill” “How Strong is the Wind,” and Combs’ other books can be ordered through Ternstyle Press at PO Box 4436, Englewood, CO 80155, or by calling 520-684 7655.